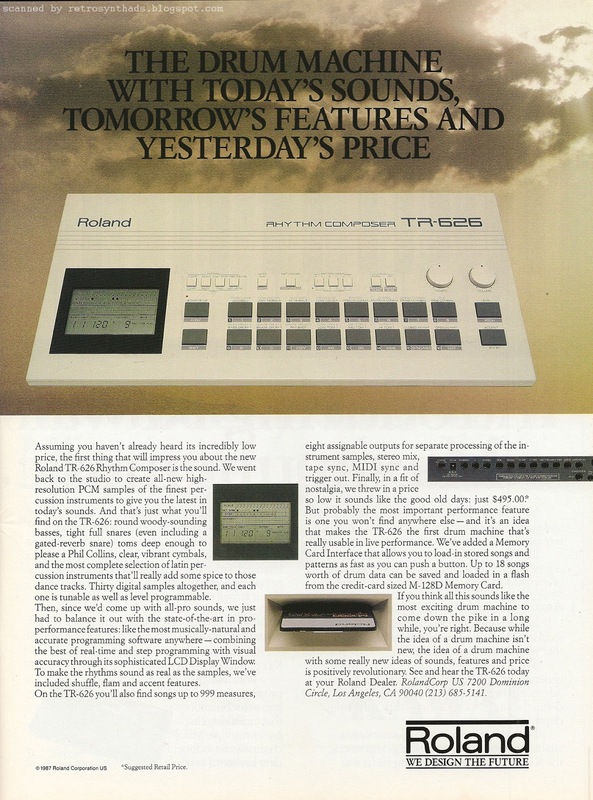 Roland TR-626 "The drum machine with today's sounds, tomorrow's features and yesterday's price" colour advertisement from page 9 in the May 1988 issue of Electronic Musician. I guess it was kind of predictable that I would post a TR-626 advertisement on 6/26 day, especially after doing the same for the also misunderstood TR-505 on 5/05 day. But it makes sense since they have so much in common, not least of which is their extremely good looks. Sure, not everyone will agree with that statement, but I love those really clean lines and beige colour scheme. The TR-626 also has a similar programming style to the TR-505 - simple and easy to play with. Can't argue with that either. But, unlike the TR-505, the 626 features eight individual outs to allow the user to separate some of the sounds out. And, speaking of sounds, it also came with a lot more of them - 30 to be exact, including three snares! In fact, sound wise, I'd almost say its more of a TR-707/727 hybrid. And did I mention those sounds are TUNABLE!?!? Sweeeeet. Roland also took a different approach to the placement of this advertisement - choosing to not advertise the TR-626 in Keyboard Magazine at all - at least as far as I can tell anyways. 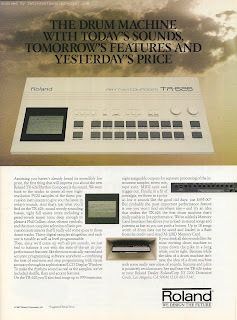 Instead, Roland chose to push the TR-626 in magazines such as Musician and Electronic Musician. Quite a long run in EM in fact, running for five months from January to May, 1988. So, what was Roland advertising in Keyboard instead during that time period? Large ads - sometimes three or four pages long - for their flagship D-50 synthesizer and S-50 sampler. I can't even find a Keyboard Report or spec sheet entry for the TR-626. It's like it didn't exist there. I gotta be wrong though, so I plan to keep checking. The ad itself isn't too colourful, keeping to the colour scheme of the drum machine itself. And it includes a lot of text. I mean, *A LOT*. And because there is no visual cue of paragraph breaks, it makes it even harder to read. Just a huge wall of words. Which is too bad, because there are a lot of good points being made throughout. I've mentioned the number of sounds, their tuning, etc above. But two other pieces of info really jump out if you do take the time to read it. First is that Roland has included the price - $495! Not too shabby, and from a historical perspective its always great to see a price included. "But probably the most important performance feature is one you won't find anywhere else - and it's an idea that makes the TR-626 the first drum machine that's really usable in a live performance. We've added a Memory Card Interface..."
I'm assuming they are making a differentiation between a memory card and a memory cartridge, which drum machines like the TR-909, TR-707 and TR-727 featured. A card can definitely hold a lot more data! Could this be the first drum machine to have a memory card interface? I'll have to do more digging! But right now I'm gonna go play on my TR-626. Don't forget to hug a 626 today!